Sometimes referred to as socket protectors or plug covers, these low cost socket covers are a convenient way to make your electrical plugs, 13a sockets and light switches, safe from damage and misuse. Where are Socket Safety Covers used? At home, they are a simple way to keep toddlers away from your electrical sockets and stop them from pulling plugs out. In schools, they are often used to protect sockets from damage - which can lead to costly socket replacement work. In kitchens and food preparation areas, not only do they protect against liquid splashes and food debris, but they also prevent freezers being accidentally switched off! In offices they stop the accidental unplugging or switching off of payment card processing terminals, fax machines, or computers that are in use, among other things. ...in fact they are used to protect sockets and plugs in almost any environment, from the home to the factory or scientific laboratory! Protecting your toddlers - as a baby becomes mobile they suddenly find a whole new world to explore and with power sockets normally positioned close to floor level, they are a natural target for inquisitive minds and little fingers. Childproof - Socket-Pro Socket Covers offer total protection against tiny fingers, preventing children from playing with electrical sockets switching off sensitive equipment (i.e. computers, freezers, etc) or pulling plugs out. For damp areas - as it`s splash-proof, Socket-Pro also offers ideal protection for sockets and switches in damp areas such as kitchens, pubs, etc. 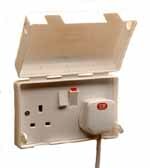 Simple to fit - practical, effective and attractive, the Socket-Pro socket safe is quick and easy "DIY" fit product. The units simply clip over the facia plate of the switch or socket, so you don`t need to touch the electrical wiring when you install it. ...remember "Socket Inserts" are dangerous and Should Not be Used! these products actually "Increase the Risk"
The SocketPro range of socket protector covers are designed to be used with "flush fit" and "surface mount" sockets and switches. Practical protection with a budget price tag! Childproofing is achieved by the simple clip mechanism which requires the co-ordination level of a child aged 8. Although UK sockets have some built in safety features, low cost Socket Safety Covers (which enclose the whole socket as well as the electrical plugs), provide valuable added safety, as well as many other benefits. They are providing a practical solution to a wide range of problems in homes, offices, schools and businesses of all types throughout the UK. What do our customers say about SocketPro Safety Covers?